White on white immediately sprang to mind, even though you are allowed to start with white cardstock and colour it to within an inch of its life. 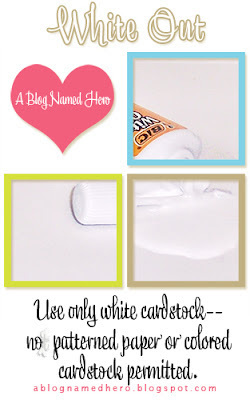 But there's something quite uplifting about white on white, particularly for wedding cards. Appropriately, the challenge at Less is More this week is Love and Marriage, which fits very nicely. The shaped card is from Craftwork Cards, as is the Paisley embossed aperture panel. The stamp is by Rubber Stampede. So beautiful and elegant! A really lovely wedding card! This is breathtaking, Shirley! Love it! What an awesome frame, Shirley. This will be another winner, girl! You should have tooted your horn at CASual Fridays with a "Star" (for Shirley) and, of course, a bee!! Gorgeous! I love white on white, but don't do it very often. The paisley embossing folder is so lovely. Beautiful card. I love white on white and that embossed frame is just gorgeous. ann Y.
Wow this is a gorgeous card, I really love white on white. Thanks so much for joining in the fun at ABNH. I love white on white! How gorgeous is this framed card! I love love love this. Very elegant. Gorgeous. 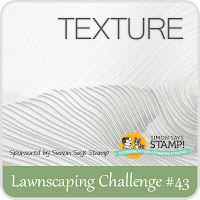 Thanks you so much for joining us Lawnscaping gals for our texture challenge!! This is absolutely jaw dropping gorgeous! So classy and so elegant! What a super elegant and beautiful card you've created! Love it! Thanks so much for joining our texture challenge at Lawnscaping! Absolutely lovely! Thanks so much for playing with us at Lawnscaping! What an elegant card! Love it! Beautiful! Thanks for playing along at A Blog Named Hero!